A surgical case of metachronous metastases of pancreatic head cancer (PC) to the large and small bowel is extremely rare. Therefore, there are only a few reports about surgery for intestinal metastases from PC. An oncologic emergency is defined as an acute, potentially life-threatening condition in a cancer patient that developed directly or indirectly because of the malignant disease or cancer treatment. A 63-year-old man with PC underwent pancreaticoduodenectomy after receiving neoadjuvant chemotherapy with gemcitabine and S-1. Histopathologically, the tumor was diagnosed as poorly differentiated, tubular adenocarcinoma, with pT2, N0, pStage IB according to the UICC classification, seventh edition. R0 was achieved. Three months after pancreatoduodenectomy, blood tests showed coagulation derangements with high C-reactive protein (CRP 11.30 mg/dl). Computed tomography (CT) scan revealed a 55-mm mass alongside the transverse colon. During 2 weeks of follow-up, the coagulation derangement and elevated CRP persisted. Repeat CT showed that the tumor enlarged to 65 mm, and an additional mass, 25 mm in diameter, was detected in the jejunum. He was hospitalized due to abdominal pain and diarrhea with persistent high fever and was inspected; however, there was no evidence for infections. With the understanding that his life-threatening symptoms were secondary to the underlying malignancy, extirpation of the tumors combined with partial resection of the transverse colon and the jejunum was performed on the eighth day of hospitalization, on an emergency basis. The lesions were identified as large and small bowel metastases from PC because histopathological examination revealed morphological features similar to the primary disease. Immediately after the emergency surgery, the fever resolved and the CRP level normalized. He was discharged and received nab-paclitaxel with gemcitabine chemotherapy for 2 months postoperatively. He selected for best supportive care after this. The patient died due to a relapse with mesenteric lymph node metastasis 7 months after the emergency surgery. Surgery as an oncological emergency for selected patients could sometimes contribute to improving patient’s quality of life. Recurrences after curative resection for pancreatic cancer (PC) are commonly found in the liver with locoregional recurrence being the second most frequent site . As recurrence is associated with a significantly poorer prognosis, surgical resection of the recurrence site has generally been unacceptable. A surgical case of metachronous metastases of PC to the large and small bowel is extremely rare . Therefore, there are only a few reports about surgery for intestinal metastases from PC [2–4]. An oncologic emergency is defined as an acute, potentially life-threatening condition in a cancer patient that developed directly or indirectly because of the malignant disease or cancer treatment. Even in terminal cancer patients, there were several reports about the treatment with surgical intervention for oncological emergencies . Herein, we present a case involving pancreatic head cancer requiring surgery for an oncological emergency relating to metachronous intestinal metastatic lesions after pancreatoduodenectomy (PD). A 63-year-old man with pancreatic head cancer underwent pancreaticoduodenectomy (PD) after receiving two courses of neoadjuvant chemotherapy with gemcitabine (GEM) and S-1 for 6 months preoperatively based on the protocol of clinical research (Japan Adjuvant Study Group of Pancreatic Cancer 04 study). Ascites cytology was negative of cancer cell. Histopathologically, the tumor was diagnosed as poorly differentiated, tubular adenocarcinoma, with pT2, N0, pStage IB according to the UICC classification, seventh edition . R0 was achieved. After the surgery, he received adjuvant S-1 therapy. Three months after PD, blood tests showed coagulation derangements with high C-reactive protein (CRP 11.30 mg/dl). 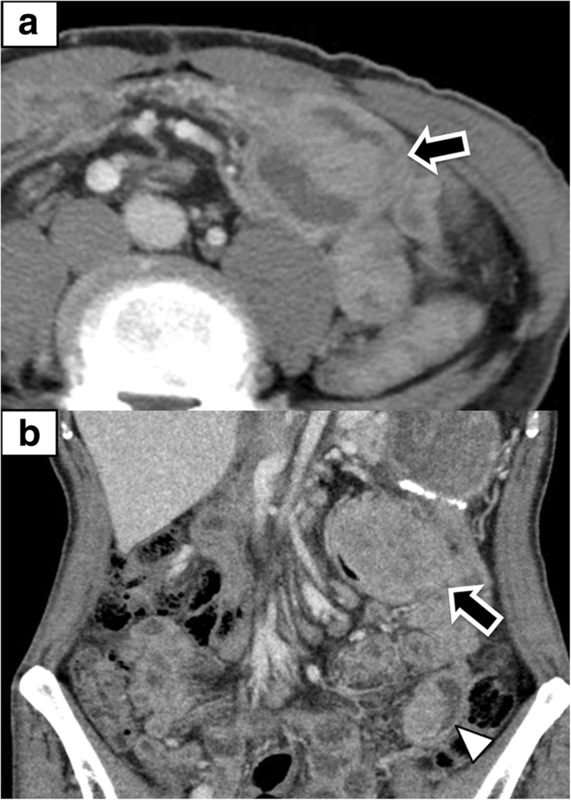 Computed tomography scan (CT) revealed a 55-mm mass alongside the transverse colon (Fig. 1a). During 2 weeks of follow-up, the coagulation derangement and elevated CRP (17.66 mg/dl) persisted (Fig. 2). Repeat CT showed that the tumor enlarged to 65 mm, and an additional mass, 25 mm in diameter, was detected in the jejunum (Fig. 1b). He was hospitalized due to abdominal pain and diarrhea with persistent high fever and was inspected; however, there was no evidence for infections. With the understanding that his life-threatening symptoms were secondary to the underlying malignancy, extirpation of the tumors combined with partial resection of the transverse colon and the jejunum was performed on the eighth day of hospitalization, on an emergency basis. 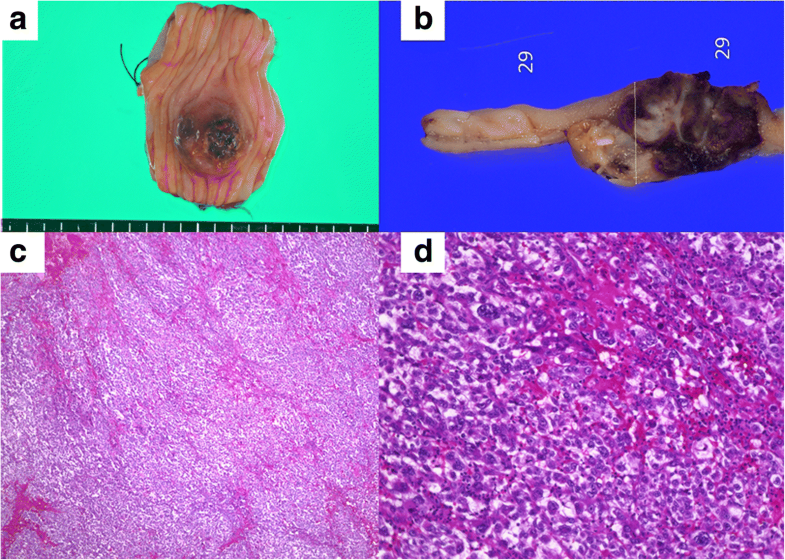 Figures 3 and 4 showed the histopathological findings of the two lesions. In both resected specimens, the tumor extended to the submucosal layer and occluded the lumen of the bowels. The lesions were identified as large and small bowel metastases from PC because histopathological examination revealed morphological features similar to the primary disease. Ascites cytology at this time was also negative of cancer. 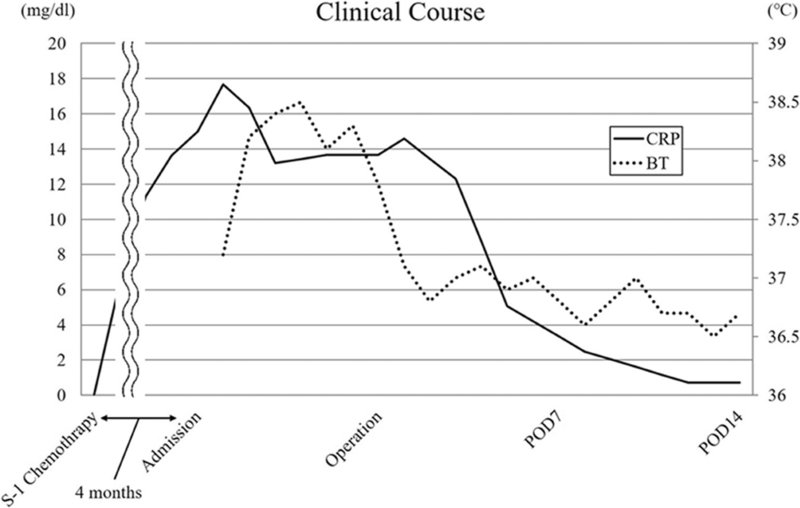 Immediately after the emergency surgery, the fever resolved and the CRP level normalized (Fig. 2). He was discharged and received nab-paclitaxel with GEM chemotherapy for 2 months postoperatively. He selected for best supportive care after this. The patient died due to a relapse with mesenteric lymph node metastasis 7 months after the emergency surgery (13 months after the first surgery). In general, patients with PC recurrence are not considered as surgical candidates. Even if a metastatic lesion was thought to be solitary, it is usually treated as a systemic disease. However, in oncological emergencies, surgical intervention should be considered. In the past decades, several reviews about oncological emergencies and their general management have been published . Obstruction of the gastrointestinal tract is the most frequent surgical emergency seen in practice  . In malignancies, surgical interventions such as bowel resection, bypass, or ileostomy may provide good palliation by reducing symptoms and alleviating obstruction but remains dependent on the disease extension in each individual patient . As the patient’s condition is often very poor in the emergency setting, especially for patients with end-stage disease, emergency surgery is associated with rates of morbidity of up to 61%, 30-day mortality of 9.8%, and overall mortality of 15–37% . On the other hand, endoscopic alternatives for surgery include tumor ablation and decompression by stent placement . Thus, in case of malignant obstruction, some reports highlighted that surgery for malignant obstruction should be reserved for patients with resectable disease, good performance status (ECOG > 1), and a life expectancy of more than 6 months . In the present case, the patient had deranged coagulation, fever, and elevated CRP, and in the absence of infection or others diagnoses, malignancy was presumed to be the cause. Tumor-produced inflammatory cytokines sometimes cause fever, which is commonly seen in hematologic disease, but also occurs in solid tumors. Thus, the surgical intervention was performed on an emergency basis. Furthermore, as there were two lesions in the intestine, bowel resection was performed instead of a bypass, which was less likely to improve the bowel obstruction. Consequently, he was able to go back home and survived for 7 months after the emergency surgery. Because there were few reports about metachronous intestinal metastases after PC surgery (Table 1), it is unclear whether surgery could improve these patients’ prognoses. However, in oncological emergencies, surgical intervention is expected to improve patient’s quality of life. Although the patient was diagnosed in a terminal cancer stage, there might be an advantage for resecting metastatic tumors. Based on the advancement of multimodality treatments, such as chemotherapy, in the recent years, even metastatic lesions from PC would turn to be resectable in some cases. Therefore, surgical resection should be considered for large and small bowel metastasis from resected PC in selected patients. 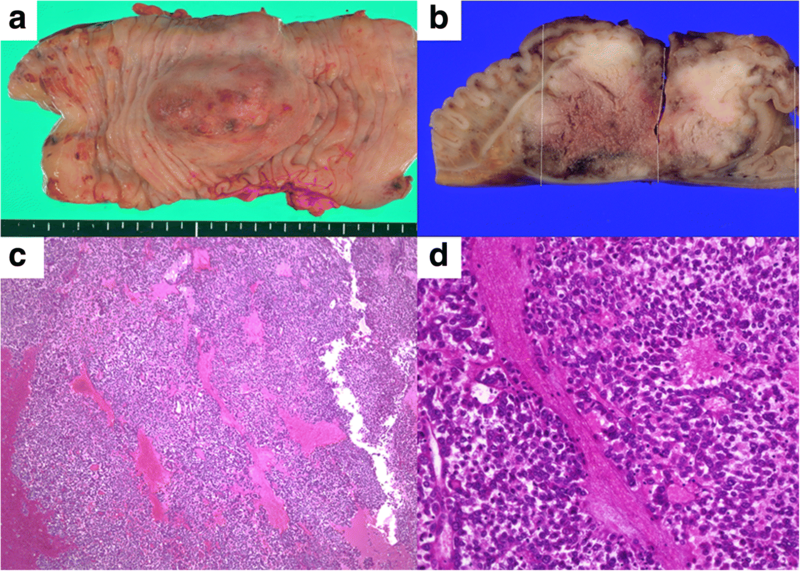 We report a rare case of metachronous intestinal metastases from resected PC. Surgery as an oncological emergency for selected patients could sometimes contribute to improving patient’s quality of life. The authors thank Yoshihiro Matsuno, a professor of the Department of Surgical Pathology at Hokkaido University Hospital, and his coworker for an excellent pathological assistance. MM and TN made a draft of the manuscript. TN, TN, TA, and KO performed the surgery. MM, YN, YE, YK, TT, SM, and TS performed the perioperative management of the patient and helped in drafting the manuscript. SH participated in revising the manuscript critically. All authors read and approved the final manuscript.